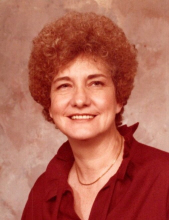 Cherryville - Mrs. Violet Green Stewart Davis, 88, of Countryside Drive, passed away on Friday, April 12, 2019 at Robin Johnson Hospice House in Dallas. Mrs. Davis was born on November 29, 1930 in Gaston County, NC a daughter of the late Rev. William Alvin Green and Ida Mae McLean Green Holbrook. She was retired from Holland-Lytton Insurance Agency and Gaston Memorial Hospital. Mrs. Davis was a member of Charity Baptist Church in Fallston and was a former member of Fairview Baptist Church in Lincolnton which her father organized and Pastored for many years. In addition to her parents she was preceded in death by her first husband, Ray Stewart; second husband, Lummia Davis; a granddaughter, Candi Hamrick Melton and a sister, Bonnie Jeanette Swan. Survivors include her daughter, Vicki S. Hamrick and husband Daniel of Cherryville; two grandchildren, Daniel Hamrick, Jr. of Lincolnton and Erin Baugham of Kings Mountain; eight great grandchildren; six great-great grandchildren and a brother, Rev. William S. Greene and wife Joanne of Maiden. Visitation will be on Monday, April 15, 2019 from 11:30AM to 12:30PM at Stamey-Cherryville Funeral Home. A graveside service will be held at 1:00PM at City Memorial Cemetery in Cherryville with the Rev. Kyeth Lindsay officiating. Burial will be in City Memorial Cemetery in Cherryville. Memorials may be made to Charity Christian School, PO Box 276 Fallston, NC 28042 or to Robin Johnson Hospice House, 5005 Shepards Way Dr, Dallas, NC 28034. Stamey-Cherryville Funeral Home & Cremation Service is serving the family of Mrs. Davis. To plant a tree in memory of Violet Green Stewart Davis, please visit our Tribute Store. "Email Address" would like to share the life celebration of Violet Green Stewart Davis. Click on the "link" to go to share a favorite memory or leave a condolence message for the family.